In a media event at its Cupertino headquarters today, Apple announced the iPhone SE, the company’s first new phone with a 4-inch screen since the iPhone 5s and 5c were released in 2013. The SE looks very much like the iPhone 5 line, as Apple’s engineers didn’t feel like designing a whole new phone, so instead they stuffed the old phone with some new insides and called it a day. The result is essentially the soul of an iPhone 6s in an iPhone 5s body. The SE model has most of the latest fancy iPhone features, like animated Live Photos and faster Touch ID fingerprint processing (UPDATE: Actually, it turns out the SE uses the old, slower Touch ID sensor), but it does lack the near-useless 3D Touch feature. Apple executive Greg Joswiak discusses the features of the new iPhone SE. Joswiak holds the distinction of being the only Apple executive whose name rhymes with Steve Wozniak. Despite its familiar trappings, the iPhone SE is a welcome release for Apple users who prefer a smaller device. See, once upon a time, Apple invented the iPhone, and you could use it with one hand, and it was a success. But then people started buying lots of Samsung phones that had huge screens. Apple said, “We wish those people would purchase our telephones instead.” So Apple invented iPhones with huge screens. And these, too, sold well. Yet they are hard to use with one hand. For a couple of years, Apple’s response to this complaint was to not care. But now it cares again, so the iPhone SE exists. It’s an iPhone for people who like their old iPhone. 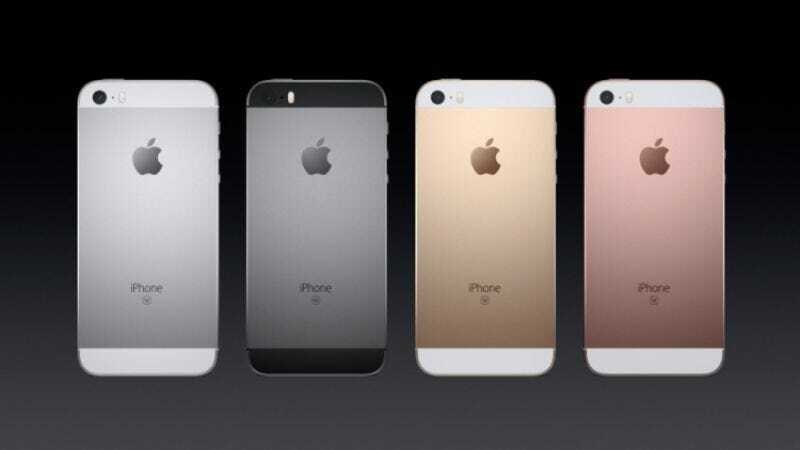 The iPhone SE will be available to order starting Thursday and will hit store shelves on March 31. For $400, you can buy an SE with a shamefully inadequate 16 gigabytes of storage, and you can look forward to many hours of tediously deleting photos and videos when you run out of space. The 64-gigabyte SE goes for $500 and will not consign you to a lifetime of frustration and regret, probably. In a banner day for smaller screens, Apple also released a smaller iPad Pro with a 9.7-inch screen to complement the 12.9-inch model that inaugurated the company’s “Pro” tablet line last fall. The new model incorporates “True Tone” display software that can automatically adjust the color temperature of the screen to match the ambient light. For instance, if you’re watching a movie in the dank hovel you occupy because you blew all your rent money on an iPad Pro, the device will strive to make itself suitably dank to match. The 9.7-inch iPad Pro will be available for purchase on the same schedule as the iPhone SE. It starts at $600 for a unit with a barely acceptable 32 gigabytes of storage. Apple also announced a 128-gigabyte model at $750 for users who might want to get some actual stuff done with the iPad, and there’s a $900 256-gig version for people who mindlessly buy the most expensive version of anything. Apple spent a few minutes during the event to tout a minor update to iOS, available today. The headline feature of the latest version, iOS 9.3, is “Night Shift,” which gradually warms the colors your screen as evening sets in—the idea being that staring at the bluish light of a typical phone screen keeps you awake more than warmer colors do. Apple executives spoke about this feature with great caution, citing “some studies” that attest to the blue-light effect and referencing “some people” who MIGHT sleep better when blue wavelengths are eliminated from a display’s color gamut. In other words, Night Shift could be just another load of hip feel-good horseshit with no discernible health benefits, like standing desks. But try it for yourself! The placebo effect is real. Enough about telephones and magic tablets, though—the important bulletin from today’s event is the announcement of new bands for the Apple Watch. The spring 2016 line of bands includes not only new colors (exclamation point!) but also a completely new woven nylon style (three exclamation points!!! ), which A.V. Club readers will probably be able to glimpse on an upcoming episode of Polite Fight, as your editor-in-chief thinks the Apple Watch is neat and likes colorful fashion things. In addition to the manufactured frenzy of consumerism, Apple also discussed its efforts to help the environment and improve medical research. Everyone in the audience politely pretended to care.